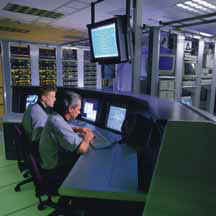 This is the Network Operations Center (NOC). It is the "nerve center" of the facility and is manned 7x24. The NOC staff is backed by a team of expert network and system level engineers who provide escalation support and "state of the art" network engineering. 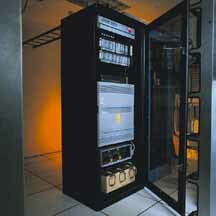 The server hub locations are designed for non-stop Internet operation. A virtually endless stream of power through Redundant Power Management Systems (pictured at right) keeps our servers operational 24 hours a day. 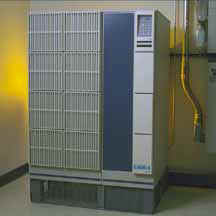 Under this system all Web Servers, Routers and critical systems receive clean, conditioned power from the UPS batteries. These are the "Big Pipes." Internet connections are through fiber optic cable from multiple major Internet backbones. This awesome connectivity assures your customers will have the fastest possible download speed, while eliminating single points of failure between your Web Site and the Internet. Speed and reliability is what this facility is all about.